Co-captain Jack Hellier was Collingwood's best with 22 possessions, four clearances and four inside 50s. Photo: Dave Savell. Collingwood’s VFL season came to a halt with a 25-point loss to Port Melbourne at North Port Oval on Saturday. The match was generally played on Port Melbourne’s terms throughout the day, but the margin isn’t reflective of just how close it was for much of the afternoon. As VFL coach Dale Tapping told collingwoodfc.com.au, the intensity of the match and the standard of the finals-hardened opposition will help in the development of his young team. “Obviously not getting the result today was disappointing for us, like anyone you want to keep going especially at this time of year,” Tapping reflected. 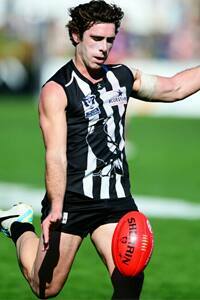 Recap collingwoodfc.com.au's live coverage of Saturday's Elimination Final loss to Port Melbourne. “But as I said to the boys, we can take a lot out of the game, such as the experience. “If you look at our team, we had ‘Jolls’ and ‘Huddo’ but outside them they were a bunch of 20-year-olds really. The match was a true arm-wrestle in the second and third quarters, with stoppage after stoppage after stoppage making for enthralling viewing. Unfortunately for Collingwood, two lapses of concentration (or more precisely, two periods of Port Melbourne excellence) cost them dearly. The first was the first 20 minutes of the opening quarter. Kicking with the aid of a strong breeze favouring the Williamstown Rd end of the ground, the Borough slammed on seven goals for the term with the only resistance coming from goals to Sam Williams and Caolan Mooney. Then, as Collingwood crept within seven points midway through the final quarter, the home side found an extra gear to pull away and win by 25-points. That extra gear was called Heath O’Farrell. The half forward bagged three goals in quick succession to turn what loomed as a thrilling finish into a comfortable Borough victory. The loss stings and will linger in the players’ minds during the pre-season but once the dust settles, Tapping knows that they will begin to understand just how far they’ve come in 2013 after several years of on-field struggle. “As I said to the boys, (during) the whole year I think we’ve come a long way and made a real impact. “We sort of built some respect back at VFL level and we’ve played really good footy throughout the course of the year. “Today we just couldn’t get any momentum. Every time we looked like getting a little bit of momentum we’d turn one over or make an error and we’d pay for it. They probably got some easier goals as we probably had to fight more for ours. Speaking of those “AFL boys”, they will continue to train with the senior side as per normal should the match committee springboard a player into finals contention. “They’ll do their rehab and prepare for this week and who knows? Huddo (Ben Hudson) was good, he could be in next week. Jolls (Darren Jolly) could be in next week. “I reckon there’s still a fair bit of stake for a number of boys. Of the individual senior players, Darren Jolly (43 hitouts and nine possessions) lifted to produce an immense final quarter that saw him threaten to drag the Magpies over the line from the centre square. Kyle Martin (26 possessions, six clearances, three inside 50s) was a force in the centre all day and pushed forward to kick two goals. Others such as Caolan Mooney (15 possessions, three inside 50s), Peter Yagmoor (17 possessions, five rebound 50s) and Jack Frost (five marks) all contributed well. Sam Williams (14 possessions, nine handball receives) was as disciplined as always and Lachlan Wallace (16 possessions) and Nick Gray (18 possessions) battled hard to keep Collingwood competitive in the midfield. Co-captain Jack Hellier was inspirational in the middle, earning 22 possessions, winning four clearances and driving his side inside 50 on four occasions. The hamstrung Clinton Young made an eleventh-hour bid to return to senior football and performed credibly with 16 possessions and a team-high seven inside 50s.